Consider this is your Asian-noodle primer: a brief taxonomy of what you’re plunging your chopsticks into, along with our picks on where to find the best examples of different noodles. What’s that slurping noise? Why, it’s the sound of Calgarians lapping up the latest Asian noodle craze. Last year’s obsession was ramen. Before that it was pho. Even chow mein was the hot new thing in its day, while udon and soba have a quiet, but loyal following. What’s great about noodlemania is that, unlike most food trends that come and go, these come and stay, giving us ever more options for fast, delicious and wallet-conscious meals in a bowl. Spicy pho satay noodle soup at Pho Dau Bo. Photograph by Jared Sych. There are few things that can compare to a hearty, steaming bowl of Vietnamese pho that warms you from the inside. Even though this dish – essentially rice noodles in a meat broth – is slightly different everywhere you go, it is always satisfying with its fragrant, rich, umami broth, slick rice noodles and tender slices of beefy goodness. A good test of a top-notch pho (pronounced “fuh”) starts and ends with the broth. Typically, the savoury taste is a result of simmering yellow onions, ginger, marrow-rich beef bones, beef knuckle, chunks of beef, star anise, cloves, sugar, salt, cinnamon and fish sauce. When made well, the soup is clear and brown, not dark or cloudy. No one flavour should dominate, but they should instead combine in each mouthful. In pho, the beef can be well done, barely cooked or uncooked, depending on how you order. Most house specials offer the whole shebang – beef balls, beef flank, brisket, tendon, tripe and slices of rare beef – a blend of chewy, fatty, moist and tender textures. The best pho joints give you just the right balance of rice noodles in a piping-hot broth, with the rare beef on top and slightly pink. This way, it remains rare and does not overcook as you stir and mix in garnishes at the table. This long-time Forest Lawn favourite gets a stamp of approval from pho-lovers of all ages (mothers and grandmothers alike swear by this place). The must-order is the Binh Minh special noodle soup, loaded with beef slices, brisket, flank, tendon, tripe and beef balls in an aromatic broth. Also, Pho Binh Minh doesn’t skimp on your fresh herbs, lime wedges, bean sprouts and chili peppers. This spot in Forest Lawn’s Little Saigon Towne Square strip mall is famous for its spicy pho satay noodle soup. You can choose chicken or beef, but we recommend having the beef satay with its tender slices of meat in the fiery broth. You know it’s hot when you’re simultaneously slurping, sniffling and sweating. At this Vietnamese restaurant located right off Centre Street the service is very fast, so you’re always guaranteed a table, making it a go-to spot despite the challenging street parking situation. Try the rare beef, flank and tripe (pho tai nam sach), a blend of tender beef and crunchy, chewy tripe in a tasty broth that’s just the right temperature. At this classic spot in Chinatown,the No.1 pho dac biet is a perfectly balanced mix of steak, well-done beef, brisket, flank, tendon and tripe in a sweet and rich broth. Definitely a hole in the wall, but worth a visit. This place moved into a new location in 2017 and has the best bun bo hue in Calgary. 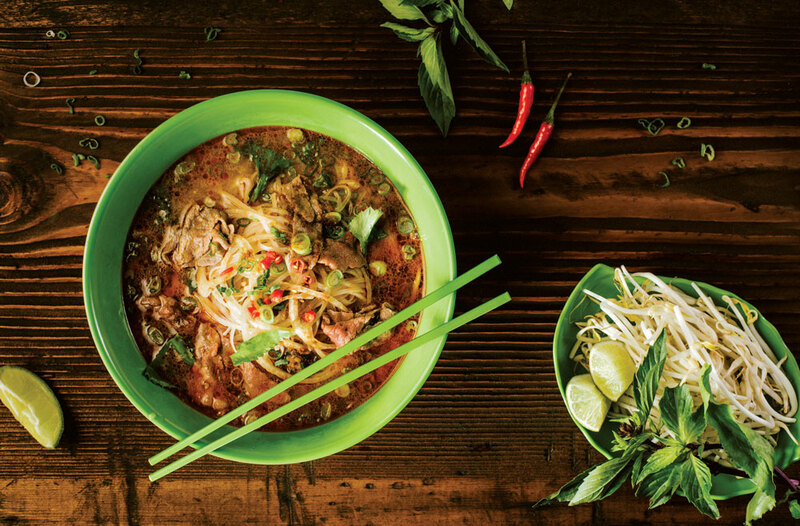 Unlike traditional pho, bun bo hue has a slightly spicy, sour, sweet and salty lemongrass broth and is made with fermented shrimp paste and a thicker, round rice noodle. Song Huong’s version is the real deal with its pork knuckle, beef slices, Vietnamese ham slices and cubed blood pudding. Tonkatsu ramen with chashu and smoked egg at Goro+Gun. Photograph by Jared Sych. To most Calgarians, ramen used to mean cheap packets of dried, compacted noodles and (very, very) salty flavour packets popular in college dorms. 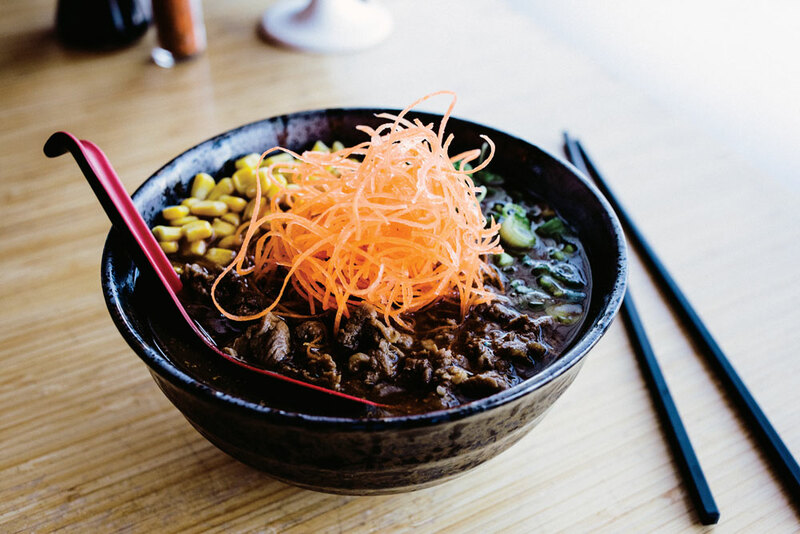 But, in the past few years, the city has seen a ramen boom of sorts, with restaurants cropping up, boasting rich, slow-cooked broths, handmade noodles and a myriad of toppings. Though ramen is associated with Japanese cuisine, some academic works claim it originated in China. Ramen is the Japanese pronunciation of the Chinese lamian, or hand-pulled noodles. Nowadays, ramen is not necessarily hand-pulled, though it still distinguishes itself from other noodles with its unique, firm, chewy texture. This is due to the addition of kansui, or water that has sodium carbonate and potassium carbonate added to it to make it alkaline. The kansui is also what gives ramen its slight yellowish colour — not eggs! While the chewiness of the noodles is important, for many people who enjoy ramen it’s all about the broth. Broths are generally categorized based on their primary seasoning. Shio, is generally a lighter, clearer broth flavoured with salt. Shoyu is a slightly darker broth flavoured with soy sauce, which adds a bit of complexity to the flavour compared to salt alone. Miso is a broth flavoured with the fermented bean paste of the same name; usually a higher-fat broth is used, making the broth heavy and flavourful. Last, but not least, is tonkotsu, which is not a flavouring, but a heavy stock made by boiling pork bones for hours until they release all of their fat and collagen, resulting in an opaque, creamy broth. Paitan is a similar broth made from chicken bones. Of course, these categorizations are just for reference, as, these days, chefs will flavour heavy broths with salt, or light broths with miso, and add their own seasonings like curry paste, sesame oil or hot sauce. Toppings add another layer of flavour and texture to the ramen bowl, rounding out the dish. There is almost always chashu, or thinly sliced pork loin or belly. Named after Chinese barbecued pork (char siu), chashu is actually slow-braised instead of barbecued, and is less strongly flavoured than its Chinese counterpart. Good chashu should be moist and tender, with a good balance of lean and fatty meat. Another popular topping is a boiled egg, with a firm white and a soft, gooey yolk. The egg is usually marinated in a soy sauce-based mixture for added flavour. Other common toppings include green onion (negi), bamboo shoots (menma), corn, seaweed and bean sprouts. Each ramen shop will have different “default” toppings on its ramen, so make sure you find out what comes with the ramen and order any extras you want accordingly to get the full experience. Tucked away in Crossroads Market, Eats of Asia serves up a different ramen special every weekend. All of them are delicious and creative, drawing flavours from other Asian cuisines — one weekend, you might get a spicy kimchi miso ramen; the next, an earthy roasted garlic with generous slices of chashu. Goro+Gun does a variety of broths in its kitchen, including tonkotsu, paitan and a seaweed broth for its vegetarian mushroom ramen. Whichever you choose, you must order the smoked egg topping — the soft-boiled, soy-marinated free-range egg is slow-smoked for 48 hours before making it to your bowl. In addition to ramen, Goro+Gun has a full menu, including sushi and hot main dishes — its happy hour is very popular. Ichi Rock has always been known for its creative sushi rolls and main dishes, and it also has ramen on its menu. The curry ramen is rich and flavourful with just a hint of spice, while the tomato ramen is a unique Italian fusion dish that uses Parmesan cheese as a topping. 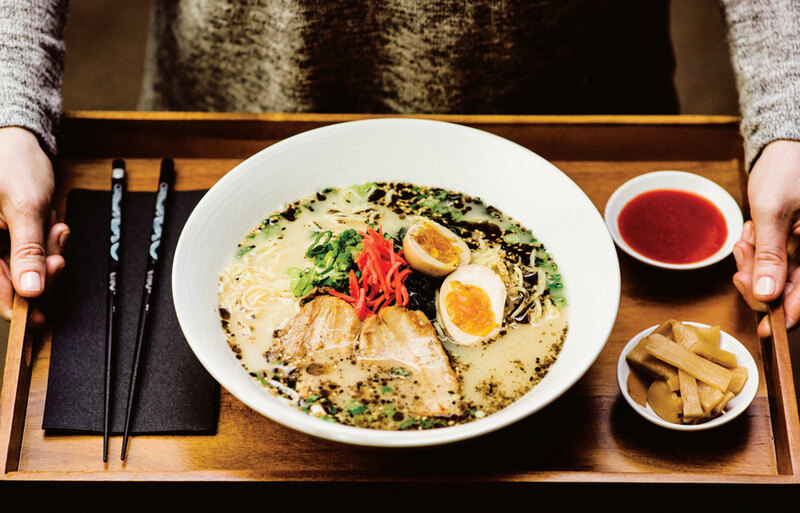 One of the first restaurants in Calgary dedicated to ramen, Muku specializes in tonkotsu ramen, but makes lighter miso and shoyu broths as well. Try the Kuro-Ton ramen, which gets its distinctive black colour from burnt garlic oil that is added to the broth. Serving only 150 bowls of ramen a day, there is almost always a line outside the door of this popular Bridgeland spot. The creamy tonkotsu broth serves as the base for the chewy handmade noodles and a variety of creative, boldly flavoured toppings. The menu is short, so it shouldn’t take many trips to try it all, though you’ll likely want to just keep ordering the chili goma ramen or the mazemen. Shanghai noodles at Sun’s BBQ. Photograph by Jared Sych. Thick and ropey and usually fried with slices of pork, a handful of vegetables and a dark soy-rich sauce, the dish that most Westerners call Shanghai noodles starts with what the Chinese widely know as the cu mian noodle. Similar enough to Japanese udon noodles (which are usually served in a soup in Japanese cuisine) that the two are often used interchangeably in Western versions of Asian recipes, Shanghai noodles are fairly simple wheat noodles with a slightly doughy bite. Since the noodles are similar to other ultra-thick noodles in Asian cuisine, what makes them “Shanghai” is the preparation. This dish tends to be a takeout favourite of families with young children — although slightly slippery, the noodles are thick enough that they can easily be picked up by chopsticks or a fork, and, while the sauce should be fairly rich, the flavours are mild enough for a kid’s palate. Cabbage and green onions (or maybe some mushrooms or bok choy) are thrown in for some crunch and brightness. Wildly popular among those living in the south end of the city, Bill’s offers five varieties of Shanghai noodles, with everything from simple mixed vegetables to mixed meat and chili sauce. Get your Shanghai fix with baby shrimp and shredded pork or satay beef at this northwest restaurant also known for its buffet. Most neighbourhood strip-mall joints make a good Shanghai noodle and this Edgemont favourite doesn’t disappoint. This often-packed Centre Street hangout serves up delicious barbecued meats, complemented perfectly by its thick Shanghai-style fried noodles. Cold soba noodles at Sushi Bar Zipang. Photograph by Jared Sych. Japanese buckwheat noodles, or Soba, are long and thin like spaghetti and slightly grey in colour. The noodles can be 100 per cent buckwheat, which gives them a stronger buckwheat flavour, but often are made with the addition of wheat flour to make them more flexible. Soba noodles are used in a variety of Japanese dishes, usually some variation of a hot soba noodle soup, or served cold, either as a noodle salad or alongside a dipping sauce. Soba soups usually come with a simple dashi broth flavoured with soy sauce and rice wine and are garnished with pork, tempura batter, fish cakes, egg or vegetables. It’s eaten much like ramen, with chopsticks and a large spoon, with loud slurping not only tolerated but encouraged. Drinking the broth directly from the bowl isn’t considered rude, so feel free to go for it and maximize your soba experience. For something less traditional, Koi offers a cold soba noodle salad with roasted beets and citrus-soy dressing. This mom ’n’ pop shop with its picnic tablecloths and ragtag decor has a certain homey charm and serves both cold and hot soba dishes. Though best known for ramen, Shikiji also makes a mean bowl of soba. The chicken, tempura and house noodle soups can all be ordered with either soba or thick wheat udon noodles. 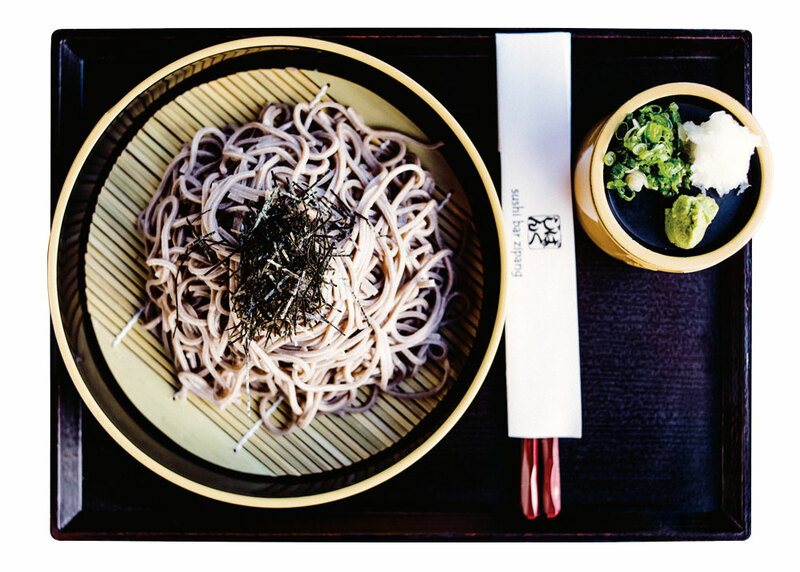 Shikiji’s Ten Zaru Soba is served cold with the traditional ten tsuyu dipping sauce. One of Calgary’s best spots for sushi, Zipang also offers soba in a number of different broths and two cold preparations (one with the traditional dipping sauce and a second with the addition of tempura). Chicken chow mein at Regency Palace. Photograph by Jared Sych. 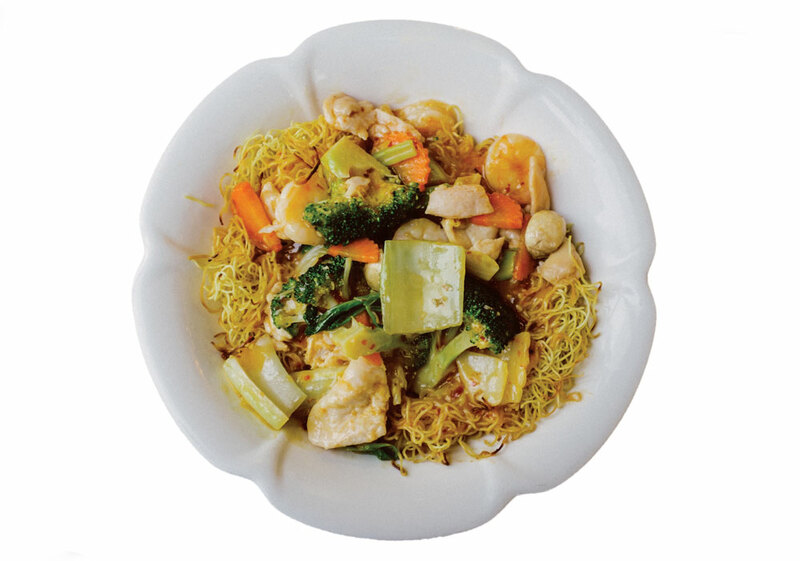 Restaurant chow mein dishes are typically served with plenty of meat (chicken, pork or beef) or tofu and thin strips of vegetables like julienned carrots, bean sprouts, green onions, water chestnuts and chives. The noodles are slightly crisped, but not crunchy, can easily be heaped up onto chopsticks and are full of lip-smacking and slightly greasy flavour. A hole in the wall with a loyal following, Fat Kee’s lengthy list of noodle dishes features eight kinds of chow mein, all with different veggie and meat combos and sauces. This suburban gem offers fresh and flavourful Chinese dishes, including five takes on chow mein with mushroom, chicken, beef, barbecue pork or shrimp. Probably best known for its seafood, dim sum and hot pots, Regency Palace also has a hefty selection of chow mein (it has its own section on the menu, separate from the other dishes). 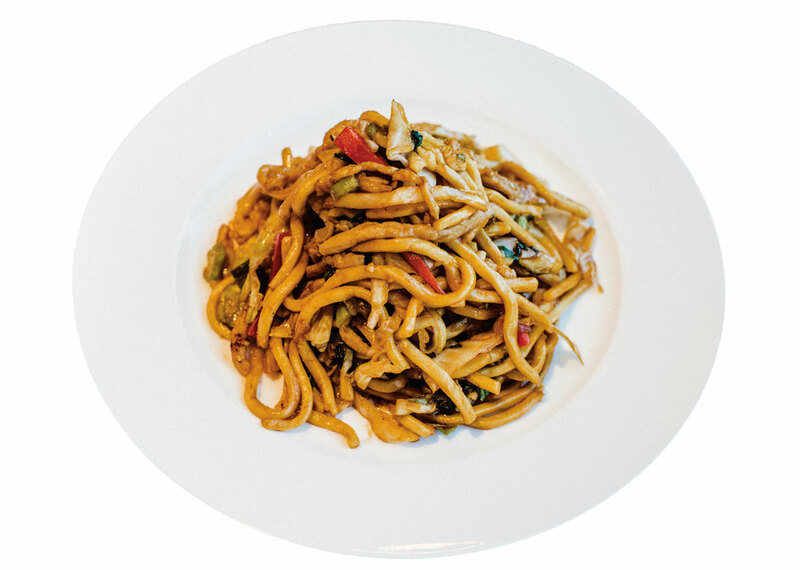 Go for standard chow mein dishes with meat and veg, splurge on the chow mein with three kinds of seafood or heat things up with the spicy Hunan chicken chow mein. Shrimp pad Thai at Khao San Thai Kitchen. Photograph by Jared Sych. Probably Thai cuisine’s most famous dish — and a good entry point for those wary of the extreme heat that comes from some other Thai fare — pad Thai is a traditional stir-fried noodle dish. The noodles themselves are rice-based, almost translucent in colour and relatively broad and flat, making them the perfect vehicle for the dish’s signature sauce. And then there’s that sauce. A combination of tamarind, fish sauce, sugar and a little bit of chili spice, it’s a unique blend of tangy, salty and sweet. Extra flavour comes from a hefty array of garnishes — usually peanuts, cilantro, lime and sprouts — and the option of adding chicken, shrimp or tofu. If you’re looking to eat your noodles in a slightly more upscale atmosphere, Khao San Thai offers a great pad Thai koong sod — a.k.a. pad Thai with prawns. 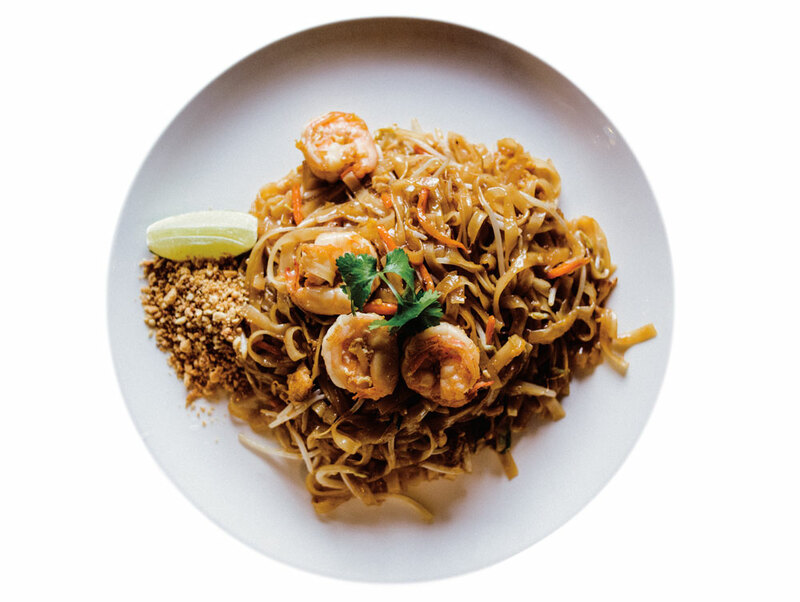 One of the city’s most highly regarded Thai restaurants, Thai Sa-on features an unsurprisingly delicious pad Thai (with chicken, shrimp and tofu), as well as a pad Thai wun sent, a similar dish featuring ultra-thin cellophane noodles. Thai Sa-on’s younger cousin, Tuk Tuk offers quick-service Thai meals. Its pad Thai is fresh and tasty, comes in a handy takeout container and, at only $10, really can’t be beat. Cash-only and taking no reservations, this tiny Thai restaurant doesn’t make things easy for its customers, but it has a rabidly loyal following, for good reason. The regular pad Thai is available with chicken, pork or beef, or you can go for the prawn version, featuring big juicy pieces of shrimp. Japanese curry udon soup with beef at Menyatai. Photograph by Jared Sych. Udon noodles are thick and round and wheat-based — basically, the same stuff you’ll find in a Chinese Shanghai noodle dish, but prepared with Japanese methods and flavours. Chewy and substantial enough for a meal, udon is traditionally served in much the same way as its buckwheat counterpart, soba, but the noodles themselves are thicker, rounder, paler and carry a milder, almost neutral, flavour. Kake udon (or su udon, depending on what part of Japan you’re dealing with) is the most basic of the udon soups, with the noodles swimming in a hot broth, topped simply with green onions. Most Japanese restaurants will jazz up hot udon bowls with additional toppings like tempura, tofu, egg, mushrooms, seafood, meat and various vegetables. This cozy Kensington noodle house serves several variations of hot udon soup (including a tasty Japanese curry udon with either chicken or beef) and a cold zara udon (served seasonally during the summer months). Menyatai also has two yakiudon dishes — pan-fried udon with beef, chicken or vegetables. Tucked into a 16th Avenue N.E. strip mall, this Japanese restaurant has a massive menu full of hot appetizers, sushi and sashimi, and teriyaki items, as well as a decent selection of noodle bowls. There are a total of eight udon dishes (that can also all be ordered with soba), including a spicy chicken soup and a bowl with breaded pork. In addition to offering a nice selection of sushi, rice bowls and other Japanese dishes, Sushi Kawa has four different udon soups, including teriyaki varieties featuring both chicken and beef.